Merry Christmas and a safe and Happy New Year, all the best to all of our customers, students, family and friends. 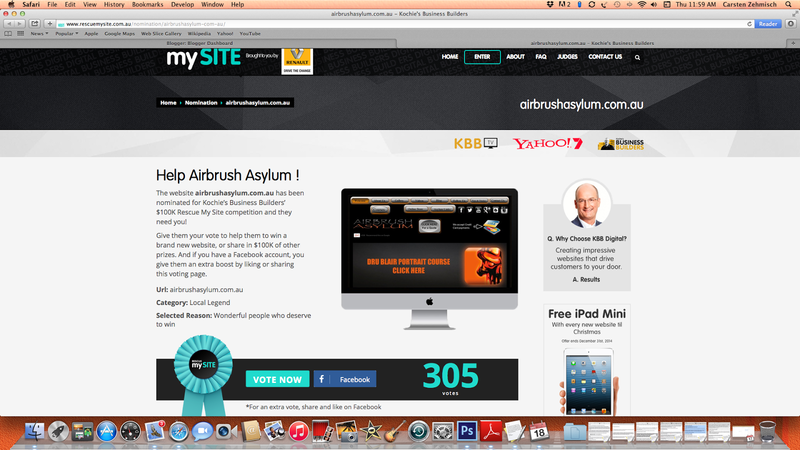 Airbrush Asylum is in the finals, for Kochies rescue my site competition. We need your VOTES. Hi Everyone…we are in the FINALS for the Kochies Business Builders competition to win 25K towards a new website. 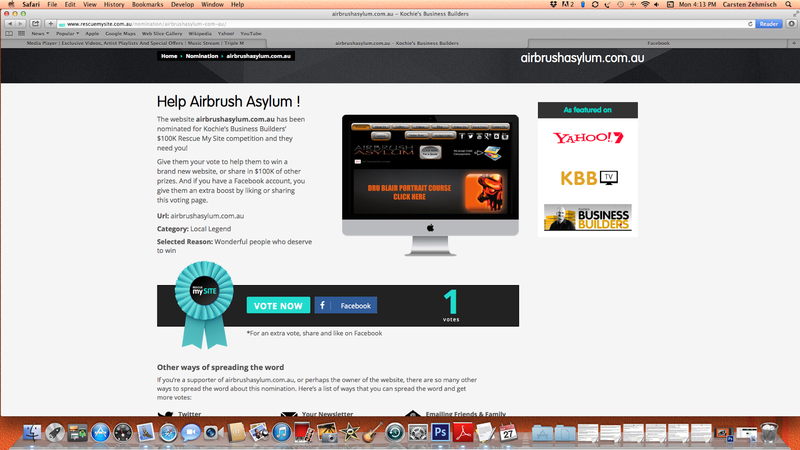 Please Vote, Share, Like using the link below, so that we can create the most amazing airbrush website and help to promote the industry throughout Australia. 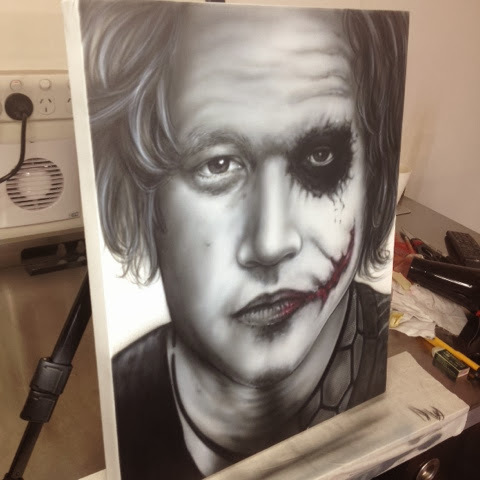 If we win, we will be creating the most unique airbrush website which will be filled with information, resources and many positive features that will benefit all airbrush artists. Winners will be announced this Sunday the 21st December on Kochies Business Builders which airs @ 11am on Channel 7. 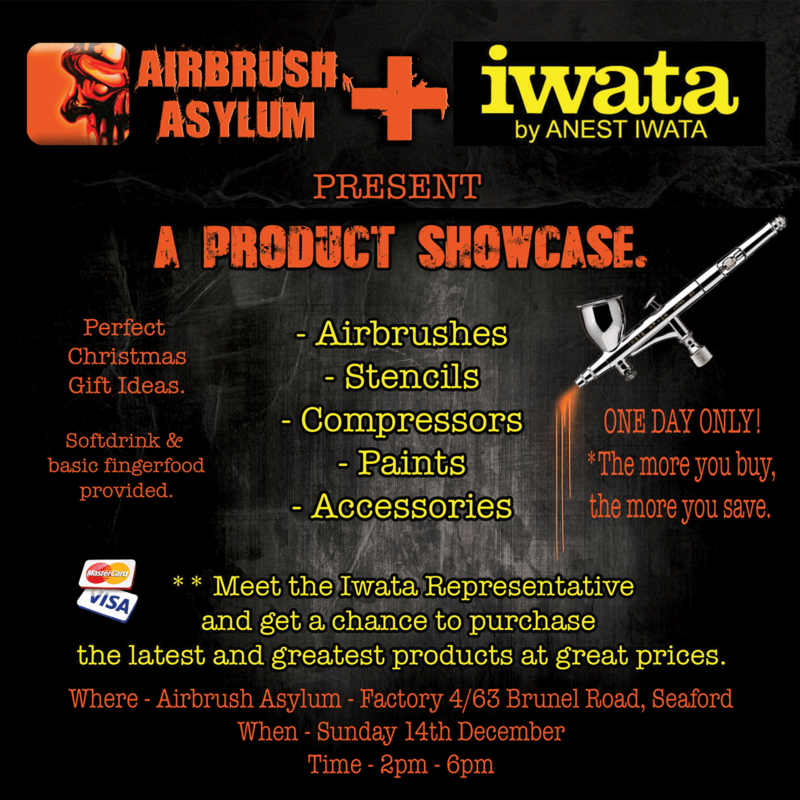 Airbrush Asylum and Iwata Product Showcase, This Sunday.. THIS SUNDAY, we are joining forces with IWATA to bring you a special Product Showcase. This is your chance to check out a HUGE range of Iwata products and get them at special prices for ONE DAY ONLY before stock ships back on Monday. 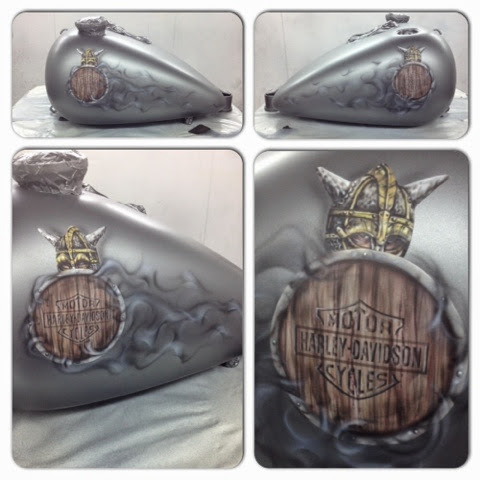 Airbrush Asylum features on TV show Man & Machine as part of their Wicko's world episode. 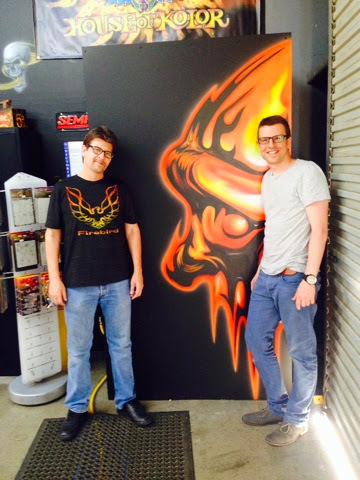 Airbrush Asylum was lucky enough to feature in the Wicko's world episode on the TV show Man and Machine. Carsten Zehmisch, owner of Airbrush Asylum has painted numerous warplanes for Jim and Jenny Wickham with this episode showcasing his artwork as well as other warbirds in their collection. 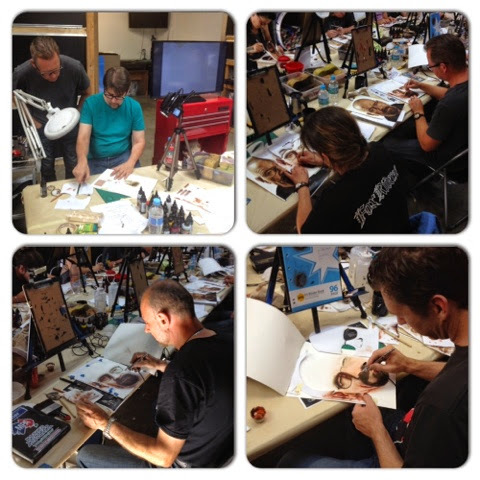 Carsten airbrushed the following planes, Hawkeye - The Indian Chief mural, Merlin - The wizard themed replica mustang and the eagle and crest on the russian warbird Yak 9UM. The Leopard plane was done many years ago by Carsten's good friend Wayne Harrison from Sydney. 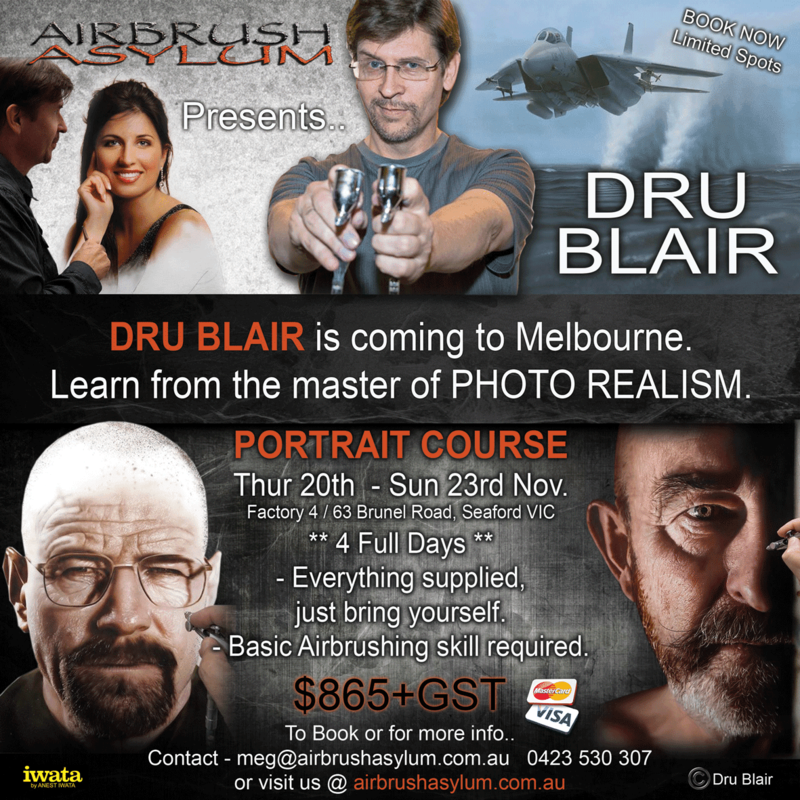 Dru Blair will be arriving in Australia soon to run his portrait courses in Melbourne, Queensland and Sydney. 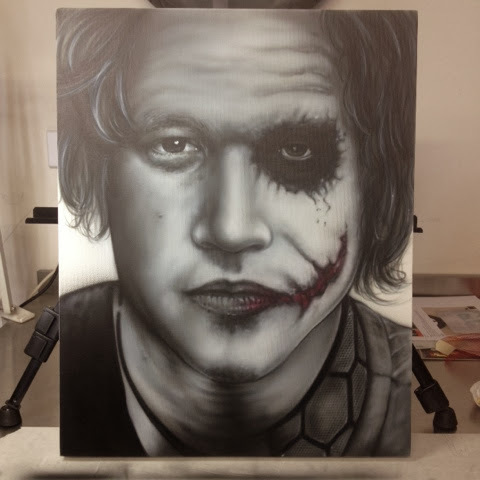 This is your chance to learn from the master of photo realism and learn his unique airbrushing techniques. Our website has been nominated in Kochie's Rescue my Site competition. We are fortunate enough to have our website nominated for the 'Rescue My Site' competition in the 'Local Legend' category for a complete website makeover. We are already avid viewers of Kochie's 'Business Builders' and love the show and all of the business information that it provides. We would love to win to be able to create an even better experience for our customers and launch a fantastic new online store to really promote our product sales section. We need your VOTES, so please click on the link below and hit vote, share, tweet, like to help us win and continue to promote the entire airbrushing industry. 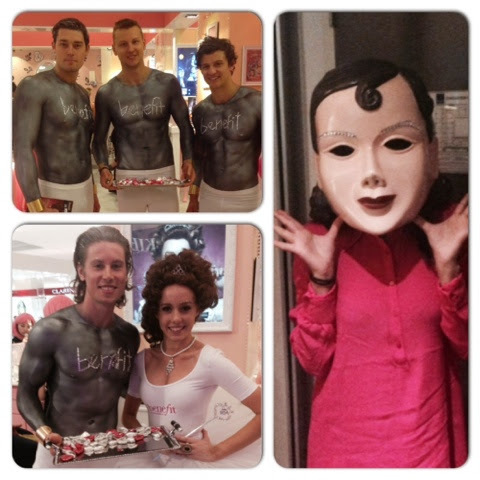 Benefit, Bling Brow Bodypainting @ Myer Melbourne. 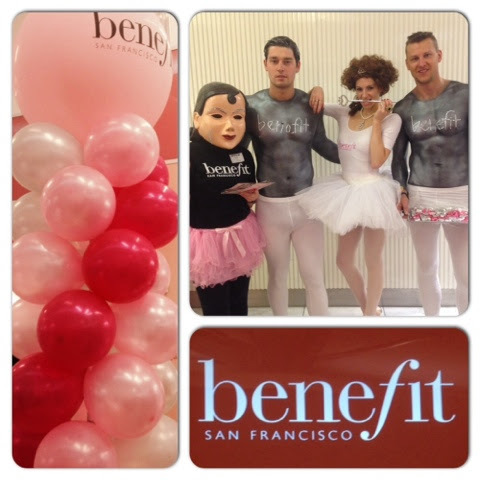 Airbrush Asylum was asked to body paint four male models in silver for the Benefit, Bling Brow Launch of the San Francisco's companies new store located at Myer Melbourne. It was an incredible event with plenty of customers already shopping in Myer stopping in their tracks to see what was going on. Lots of pictures were taken with the painted models, making it a social media marketing hit for the company and a fantastic way to promote their unique products. 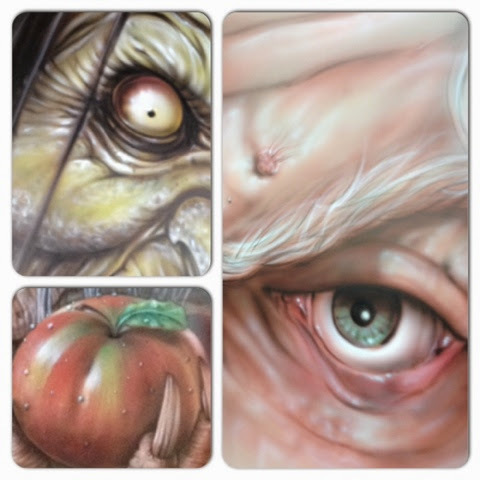 Airbrush Asylums most involved project Sneak Peek... Coming soon. One Project, over 20 murals more than 150 hours of airbrushing will be revealed soon...stay tuned to check out our most involved project to date. 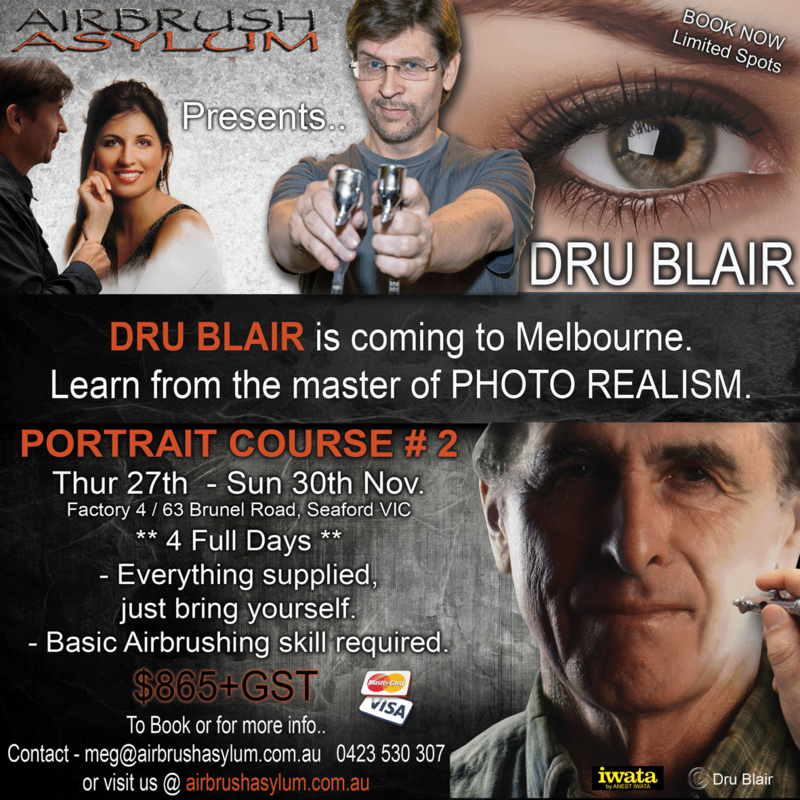 Here is a sneak peek of what is coming..
Dru Blair Secured for another Melbourne portrait Course @ Airbrush Asylum. After his trip to Melbourne, Dru will be heading to QLD with Rod Tickle and Sydney with Wayne Harrison so make sure you don't miss out on this amazing opportunity to be taught by one of the best in the world. Updates complete to our Courses section on our website. 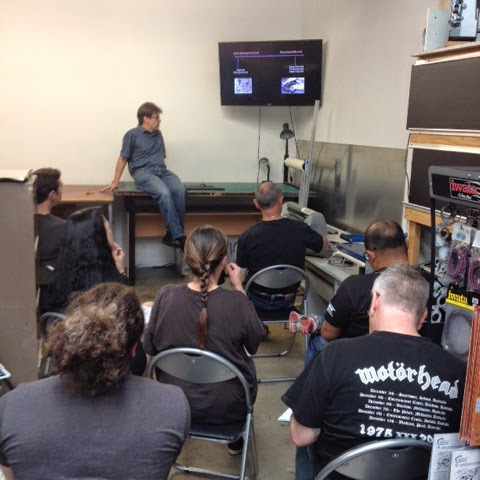 Check out our latest updates in our Courses section on our website. Easier navigation, more information and new pictures are just some of the changes. 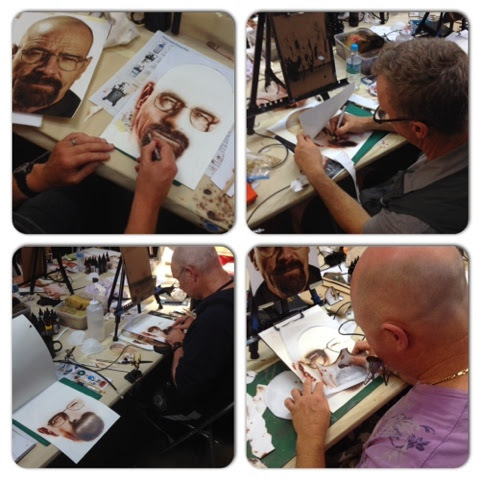 We hope that it makes it easier than ever to book into one of our classes, whether you are just starting out or you wish to further your airbrushing skills, then we have a course that will cater to you. 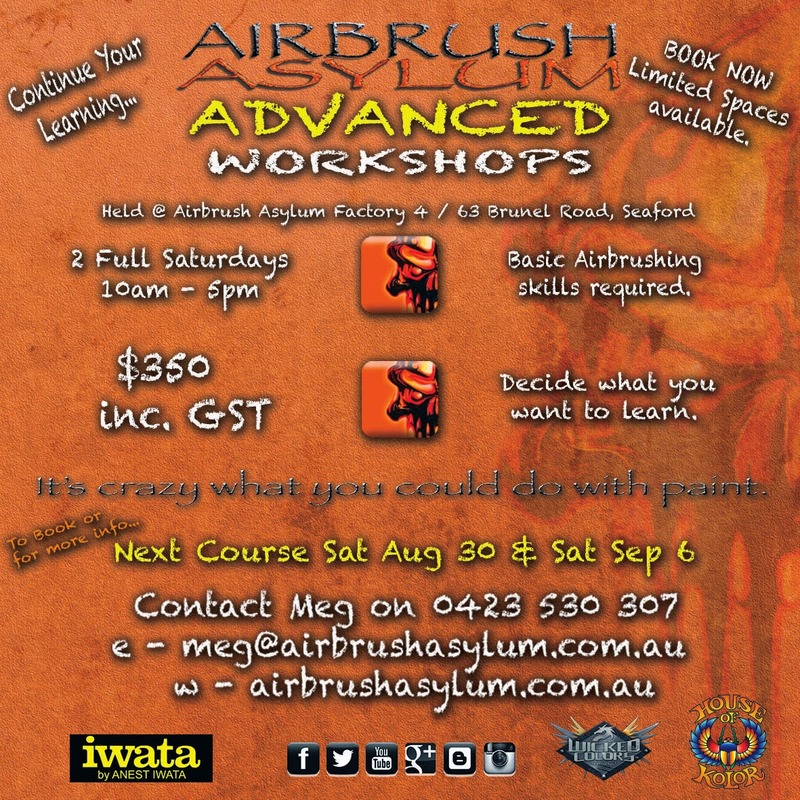 To check out the changes made, visit our website @ www.airbrushasylum.com.au and click on the courses button from the navigation bar located at the top of the page. We hope you enjoy the changes and look forward to continually working on our site to deliver even more upgrades to many more areas within our website. 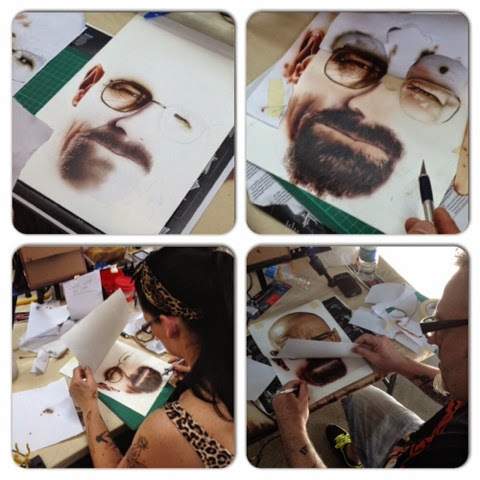 Booking Now for our next Advanced Airbrushing Workshop. Cost - $350 (inc GST) we require $100 to confirm your spot, balance due on the first day of the course. 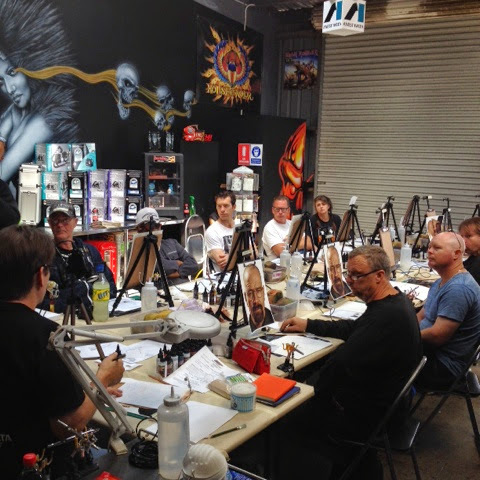 What you learn - The Advanced airbrushing workshop is designed to further your airbrushing skill and focus on what you want to learn. You bring the substrate you wish to work on ie.. T-shirt, canvas, helmet, motorcycle tank, illustration board etc.. and your reference art and we will guide you through completing the artwork on your chosen surface. **Automotive substrates must be prepared and ready to go (seek a professional to complete this for you if you are unsure, we can help with recommending someone to complete the project). What we supply - All waterbased paints, We also supply lunch, water, soft drink and tea and coffee. 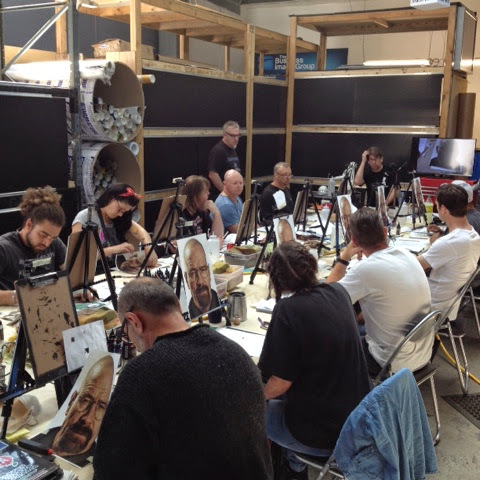 What you learn - Basic training, dots, lines, shading, special effects on paper including Rock and Space theme, completion of a B&W skull on an aluminium composite panel using an artool freehand template, render an artwork on a T-shirt to further develop your skills. What we supply - Pretty much everything, all you need to do is bring yourself ;) We also supply lunch, water, soft drink and tea and coffee. 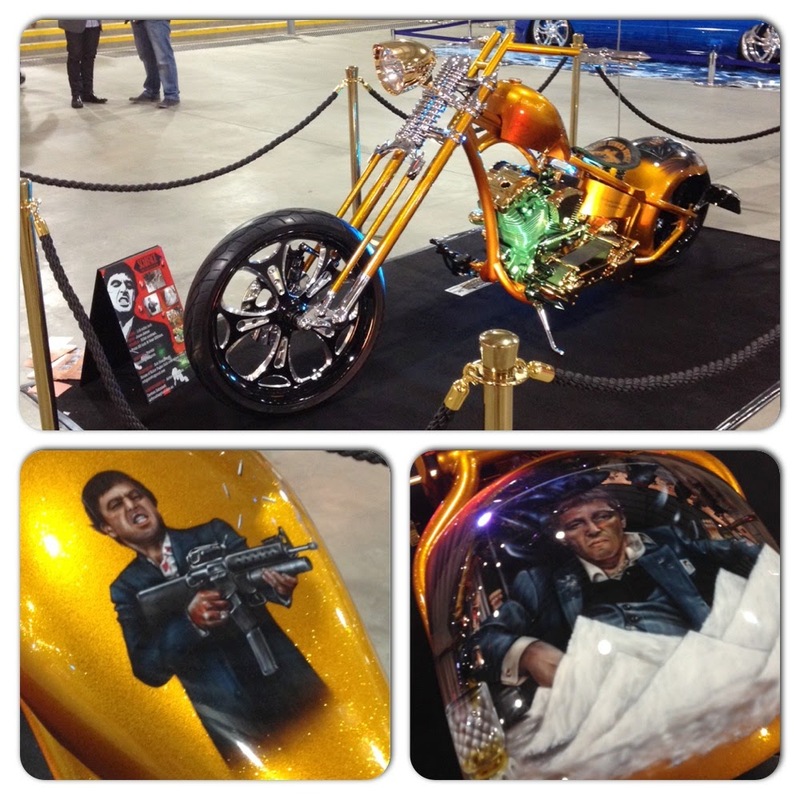 A project that we recently completed, the Scarface Chopper owned by Alex Grozdanoski was unveiled at this years Meguiars MotorEx. 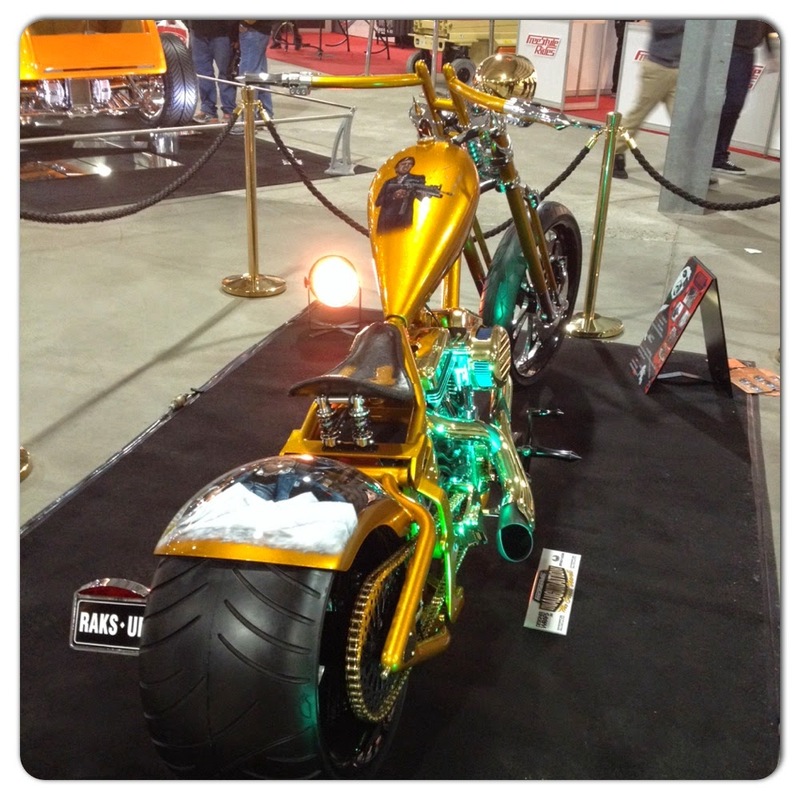 With a show packed full of Custom cars and bikes it was an honour to have some of our artwork unveiled on this one of a kind custom chopper. 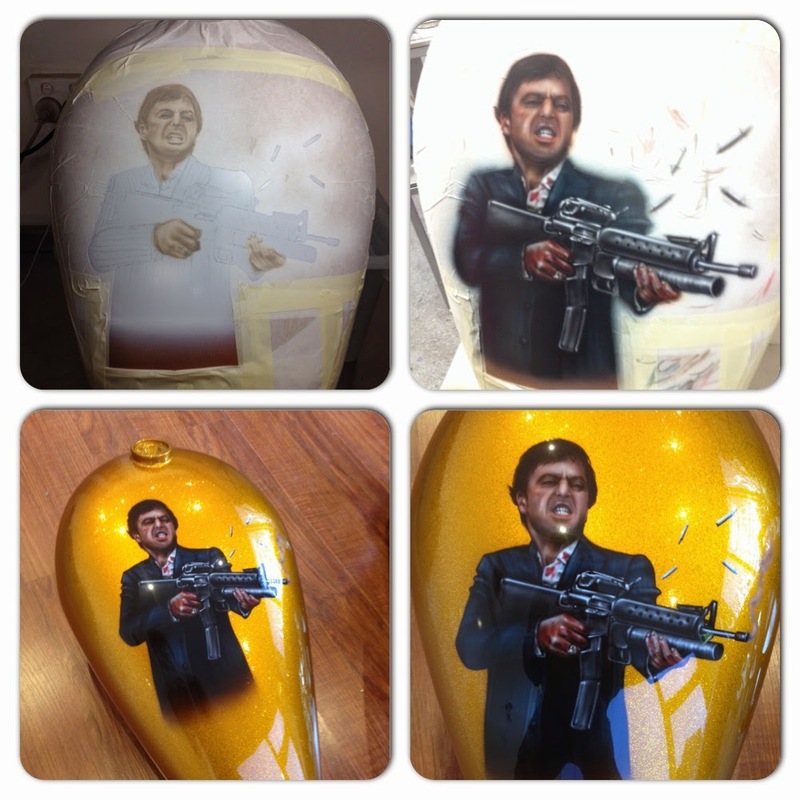 The theme for this bike was clear and it was basically a homage to Alex's favourite cult classic 'Scarface' and airbrushing some murals of Al Pacino, as his famed character Tony Montana was a perfect fit. 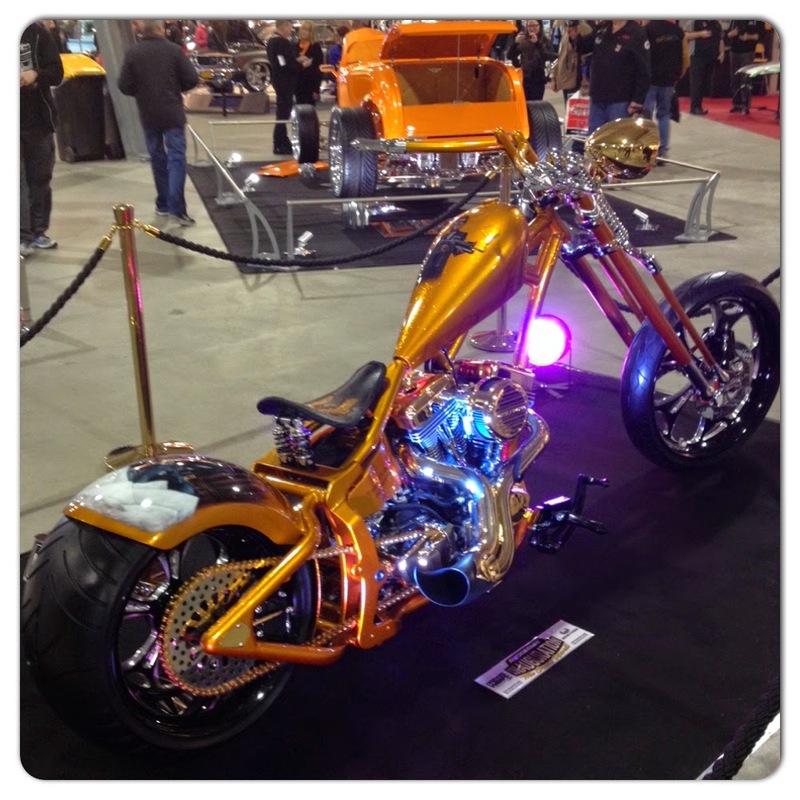 Even without any airbrushing or custom paint, this chopper is insane. 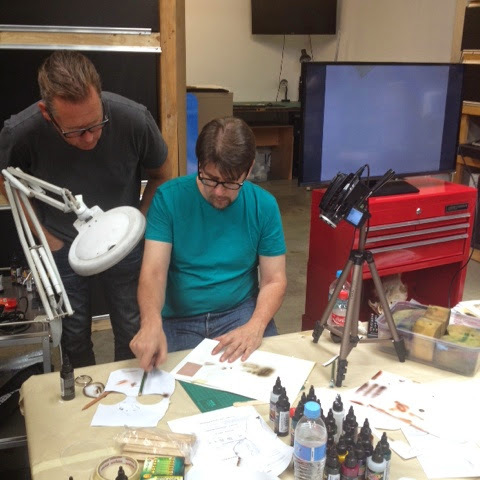 And once Alex had the frame and tins all custom painted with a silver metal flake and finished off with a House of Kolor Pagan Gold, he then brought it to us to work on selecting the best reference material for his murals, one to go on the tank and the other on the huge rear fender. As well as the murals we also added some lettering, two of his favourite quotes from the movie "Everyday above ground is a good day" and "I always tell the truth, even when I lie"which really finished off the theme and tribute to the movie. 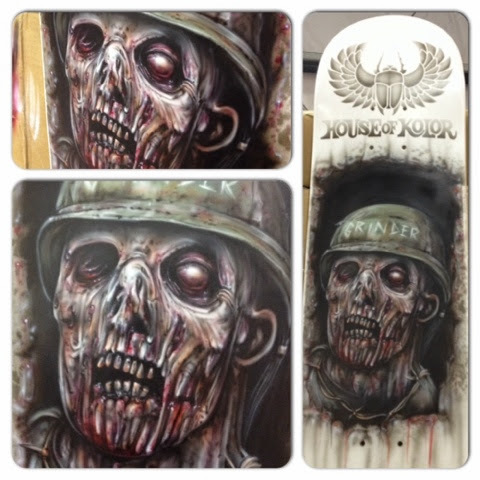 A busy day airbrushing a skateboard on the House of Kolor and Anest Iwata trade stands today at the Meguiars MotorEx auto show in Melbourne. 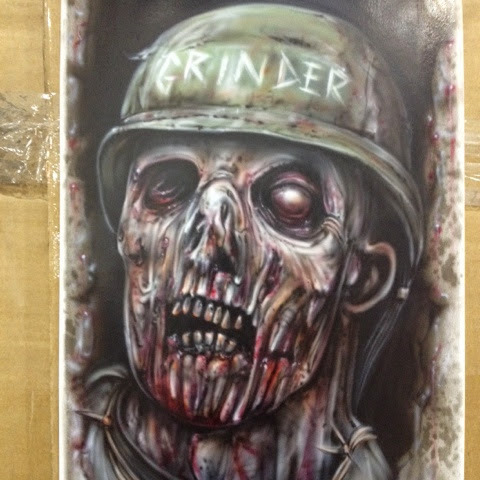 The zombie artwork was completed in approximately 6 hours, rendered using House of Kolor base coats and Kandies and airbrushed using my Iwata CM-C and various other Iwata airbrushes. 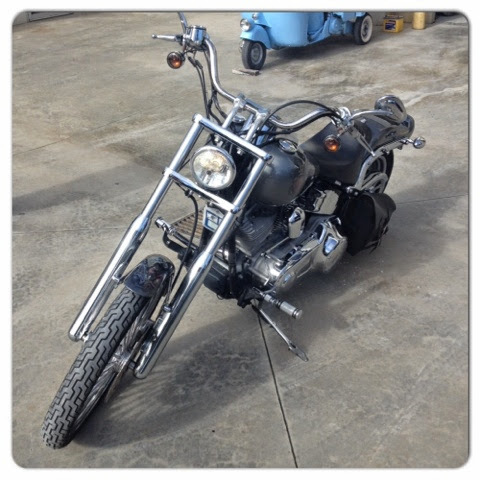 We also had a chopper unveiled which we will put in another blog post, showcasing the theme and photos. It's Crazy what we do with paint. Check out our latest Video, skull with subtle red candy flames, Part 2 Step by Step. This 2 part 'how to' video, takes you step by step through techniques used to create this skull with subtle red candy real fire on an aluminium composite panel. You will learn how to render a skull using black and white, applying red candy to the completed artwork and using the real fire stencils to create your flames. Check out our latest Video, skull with subtle red candy flames, Part 1 Step by Step. RIP HR Giger...You were the most incredible airbrush artist, sculptor and visionary, your style and skill were often copied yet never matched. In Giger's Alien, I was amazed and excited about the possibilities of the airbrush. 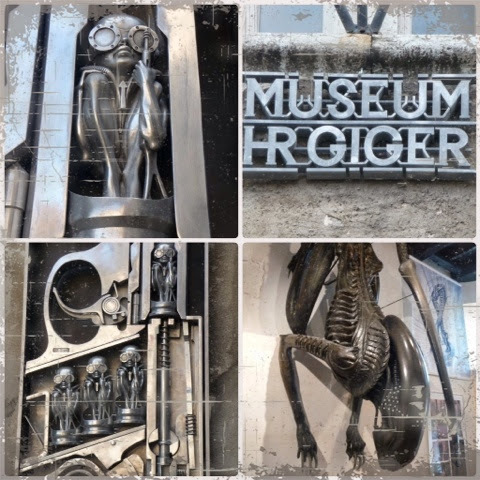 In 2008 I was fortunate enough to visit Museum HR Giger in Gruyere, which is still to this day one of my most memorable experiences. 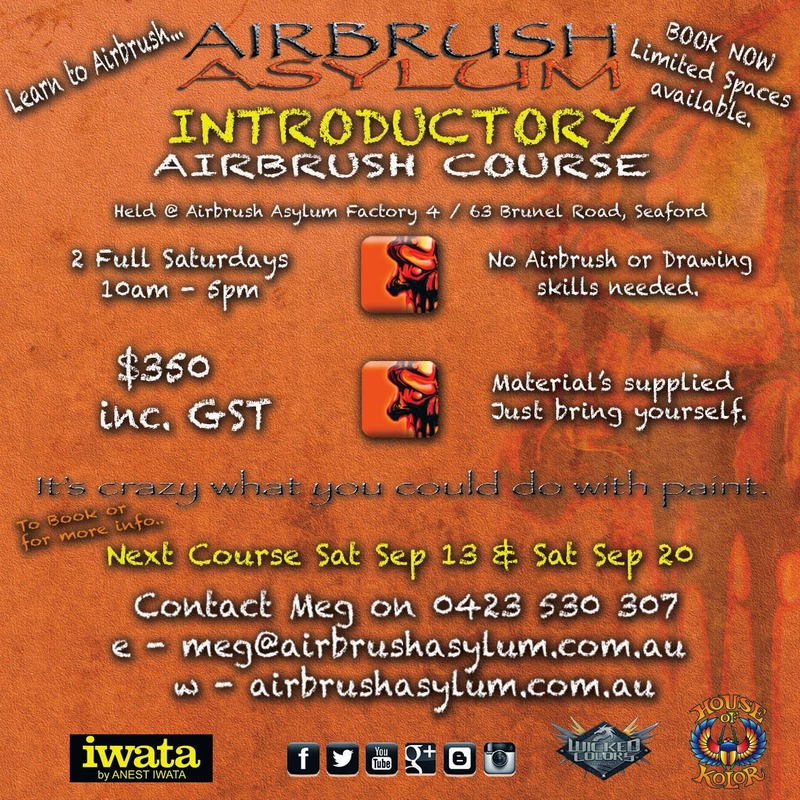 Airbrush Asylum moves into our new Venue. 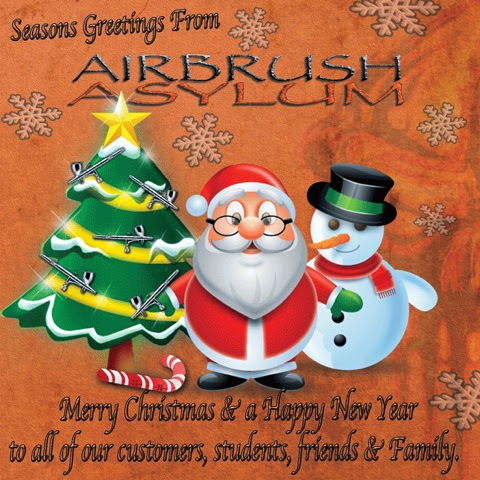 We are excited to be moving Airbrush Asylum into a factory tomorrow, with more space and a better layout we can work on larger projects and offer more classes, events and a better retail experience. We look forward to welcoming our existing clients and look forward to an exciting year filled with lots of unique projects. We will post pictures and progress of the new setup as it unfolds. 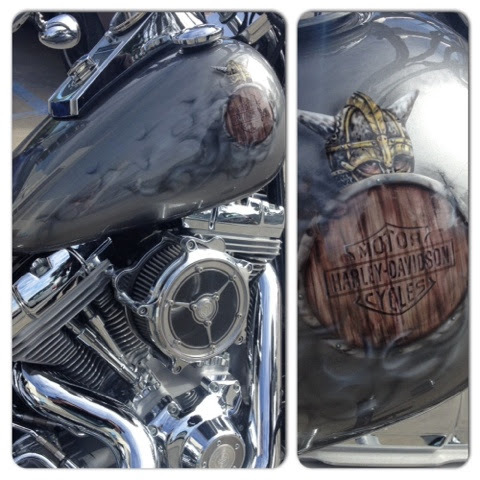 Check out the following pictures of the Viking Harley recently completed. 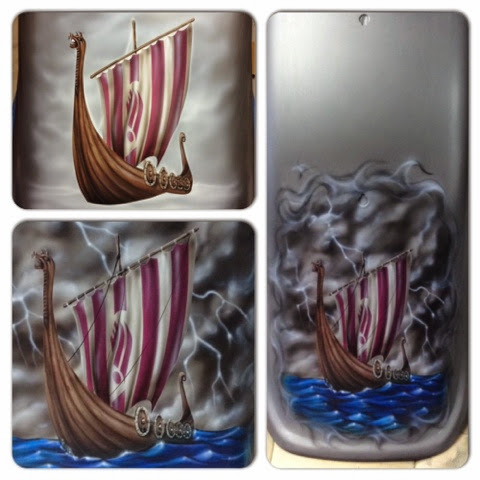 The customer is a huge fan of the hit TV series 'Vikings' therefore we worked the theme around that concept. 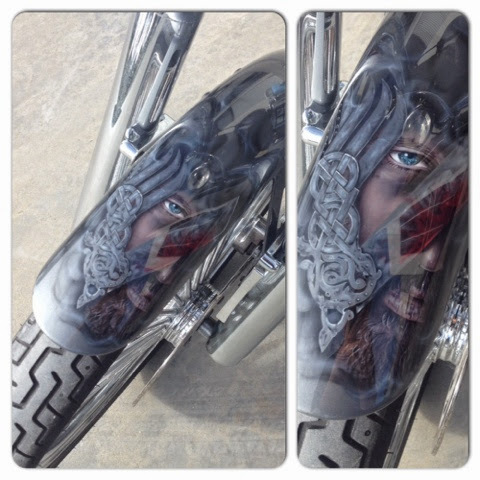 The front fender is by far the most detailed mural, showcasing Ragnar the main character from Vikings with the Viking emblem and some ghosted real fire trailing off the mural. 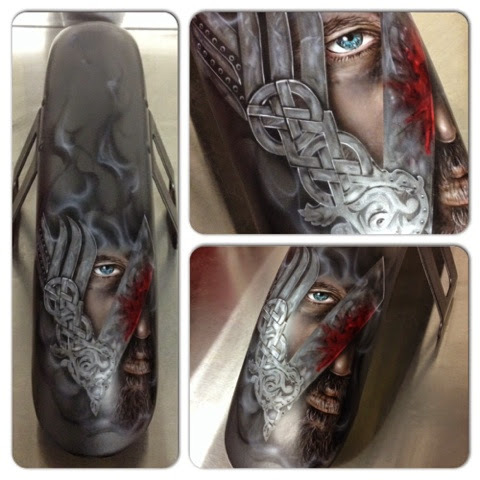 The Tank has two Viking warriors peering from behind a shield which has Harley Davidson carved into the timber. 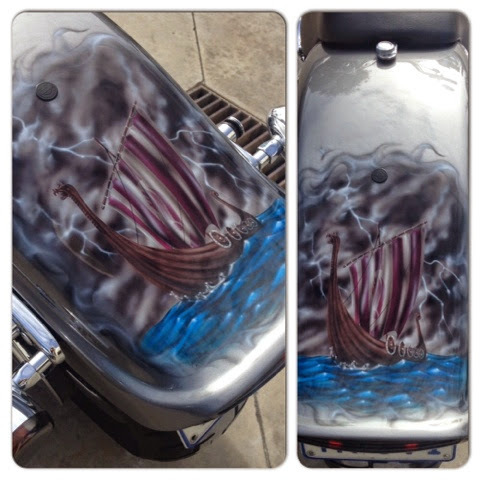 The Rear Fender has a mural of a Viking ship travelling through rough seas in the midst of a lightning storm. 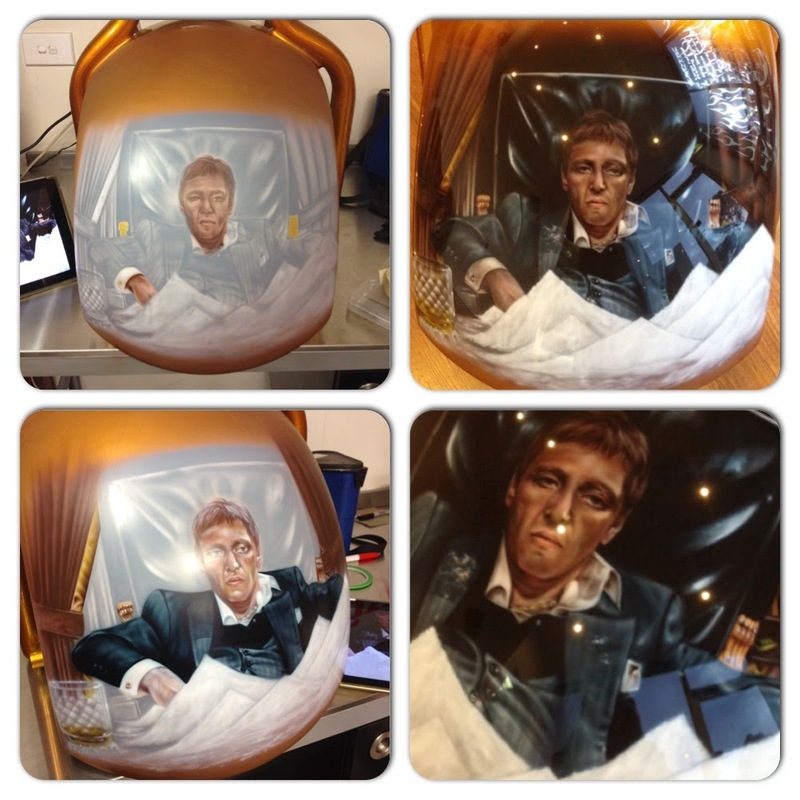 We hope that you enjoy the pictures, some artwork is shown before and after clear and I have also included some step by steps. Check out our latest video Step by Step - Real Fire. This video will take you through, step by step, layer upon layer, showing you how we create our real fire effect. 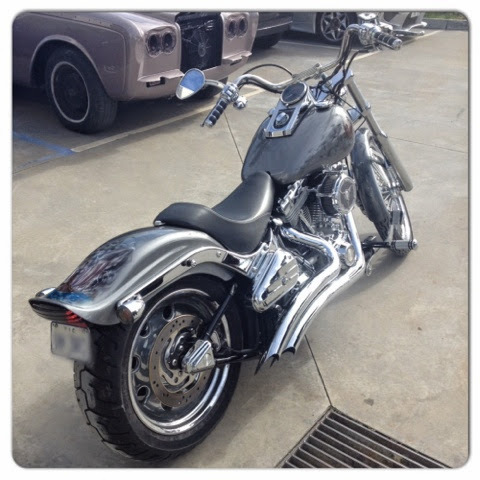 We use this effect on everything from Harley's to Cars, models, background effects amongst many other applications. We hope that you enjoy the tutorial, and that you enjoy practicing the techniques that you learnt watching the video and use them to create some crazy fire paint jobs of your own. Thanks for readin' and for more Videos and Tips and Tricks.. Check out our latest video - FrankenSkull Resin Figurine, Step by Step. A short video showing you how to airbrush and paint this FrankenSkull Resin figurine. Learn shading techniques, dry brushing and other effects which help to make this resin figurine come to life. 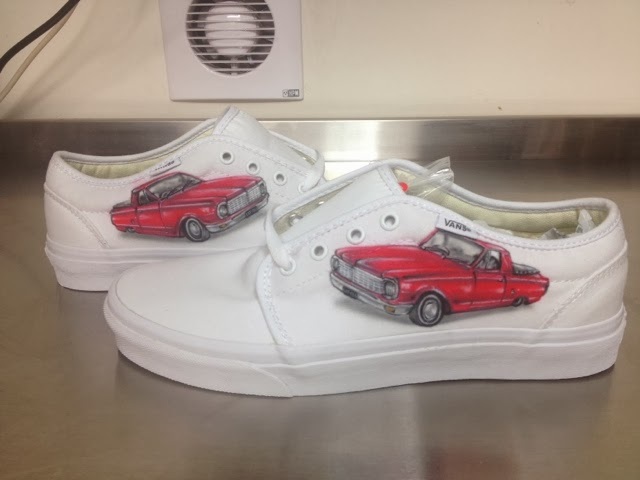 Airbrushed Vans shoes with a mural of a Ford XP Ute. 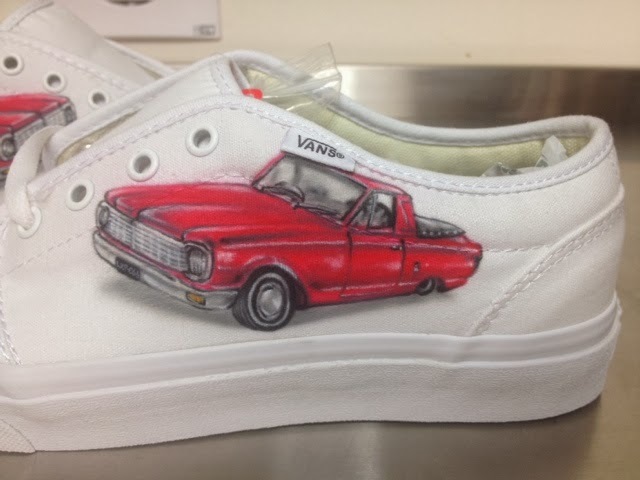 Late last year we were commissioned to complete a mural of a Ford XP Ute on either side of a pair of Vans skate / street shoes. The mural was rendered as accurately as possible, completely freehand from a reference photo supplied by the customer. 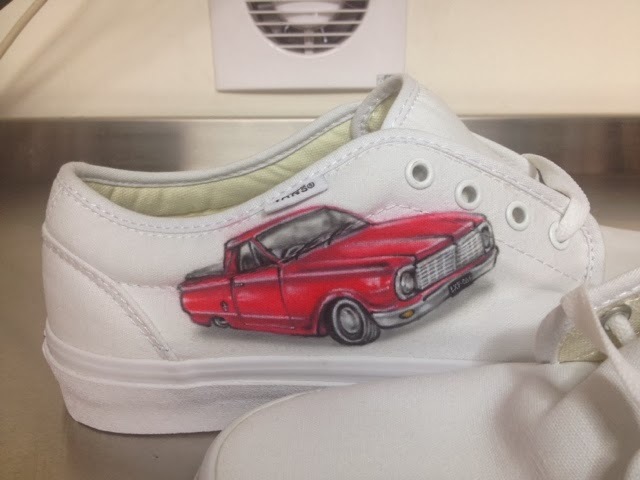 These shoes are proof that...anything can be airbrushed, although most of our work is automotive related, focusing heavily on Harley's and Custom mototorcycles...Even a pair of shoes can be rendered to become a one off piece of art that can even be worn! 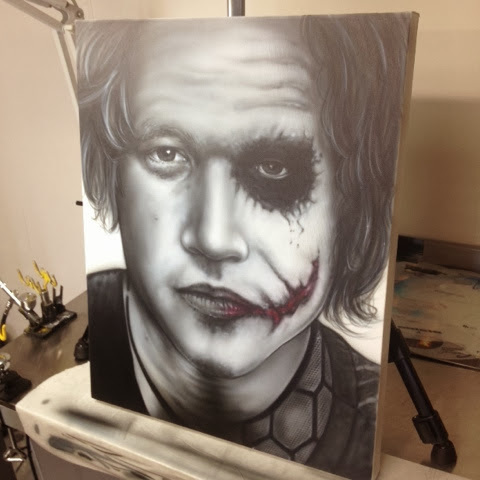 Airbrushed Heath Ledger / Joker, 16x20 inch Canvas. 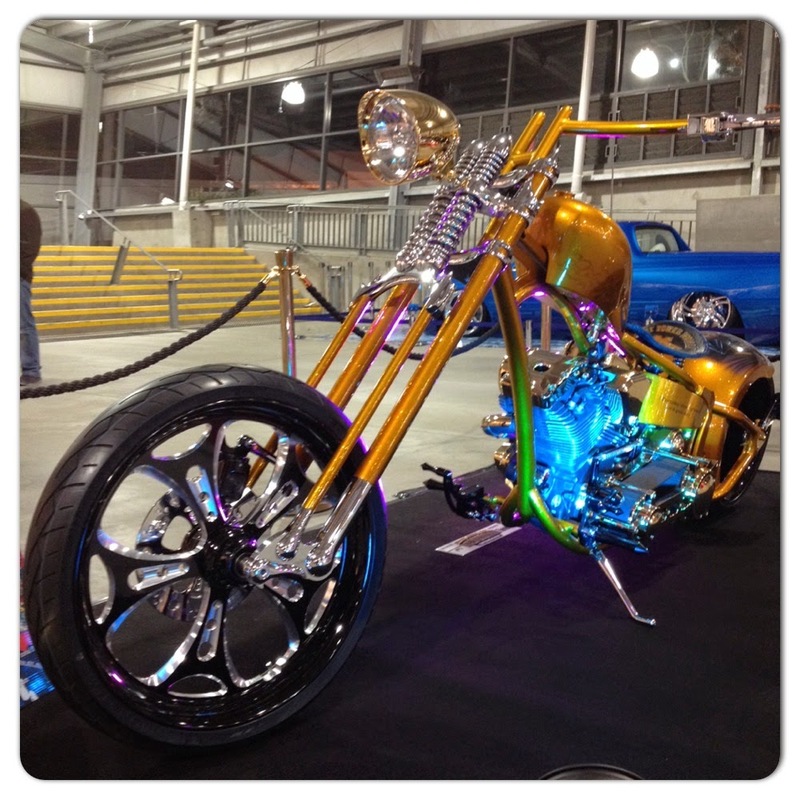 Airbrush Asylum displaying at the Kustom Nationals @ Phillip Island Race Track. 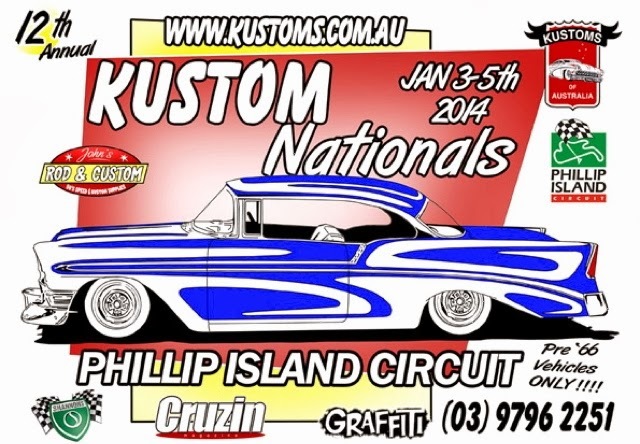 We will be displaying and airbrushing at the Kustom Nationals show this weekend. A great way to start the new year, we will be set up at Phillip Island racetrack with a couple of Harley's on display including the skulls and guns bike and the dragon and castle bike. If you are looking for something to do then feel free to visit us, we will be located inside, in one of the lock up garages with an 11x4m area to showcase some of our works. As well as the Harley's we also have the new terminator mini bonnet and the SlipKnot bonnet on display. We hope to see you at the show to check out our stand and all of the Kool Kustom vehicles...it's going to be a great Saturday and Sunday.